The Joy Formidable playing the cold LA night. The popular expression goes, “You can’t win it, if you’re not in it.” This is the mentality I go by when I want to win something. Winning contests is a wonderful thing because I get to attend events for free. I enter numerous contests online and have won many times. The latest item I won, tickets to Passion Pit at the Greek Theater. Passion Pit, a synthpop band from Cambridge, Massachusetts, headlined one of their biggest shows to date when they played the Greek Friday in Los Angeles. The Joy Formidable was in support of the headliners. The show was not even close to being sold out. Many sections were taped off. There was a good reason why. First up, The Joy Formidable. They played a 40-minute set to few hundred that were already in their seats and those that were slowly getting into their seats. Besides the extended final song in the set, nothing really stood out for this trio hailing from North Wales, United Kingdom. The female lead singer has a good voice but nothing special. I don’t think this band will be making waves here in the states anytime soon. Passion Pit has toured extensively in support of their latest album, “Gossamer,” which was released in July 2012. The band even hit up Coachella earlier this year. As they mentioned during the show, this is their last tour in support of the album. That must mean they are either burned out of the album and touring, or they are ready to write new material. At times it felt like I was at an R&B show with the soulful sounds from the lead singer Michael Angelakos, but I don’t like R&B, so it was difficult to enjoy. The cheery, upbeat rhythms from the band’s instruments also made it feel like I was at a concert for kids at times, also a downside. 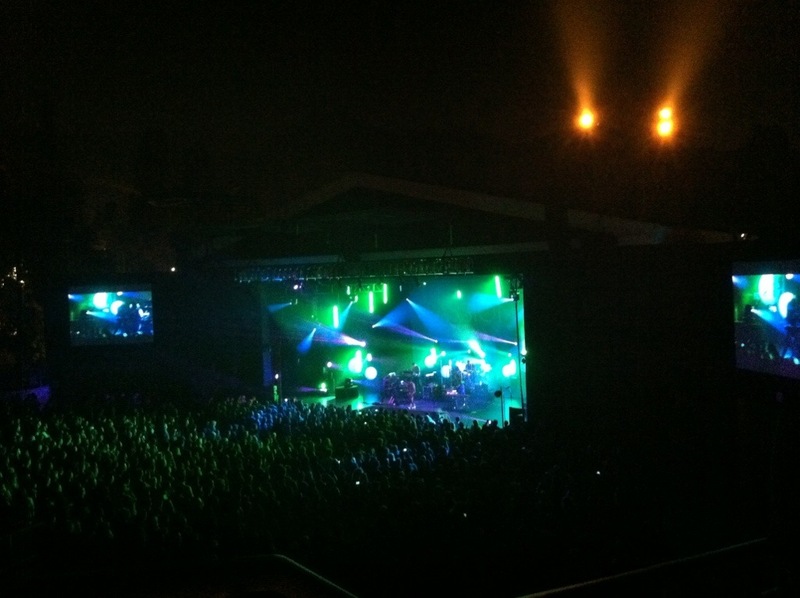 Passion Pit lighting up the astounding Greek Theater. The only one moving around for almost every song was Angelakos. His vocals were overpowering the rest of the instruments as well. I do not approve of either of these. Turn down your mic and let the rest of the band engage with the audience to make it a more memorable experience. I was not really big on Passion Pit other than their radio hit, “Take a Walk,” and this show will not lead me into the direction of loving them. It wasn’t too memorable of a show at all. I feel like you have to really love Passion Pit to enjoy them live. For those that have yet to visit the famous Greek Theater, it is one of the most beautiful venues out there. It is just below the hill from Griffith Park Observatory and the scenery surrounding the venue is spectacular. Lights are placed perfectly around and inside the venue to accentuate the features of foliage that make it one of the more special outdoor concert venues.